I have unilaterally decided that February is Vegan Soup Month. I received a lovely soup tureen for Christmas and with the cold weather I have been making a lot of soups. I came up with a a quick and easy vegan soup base made with dried mushrooms and sauteed onions (similar to my ramen soup base), and from that recipe I’ve riffed several variations. Throughout the month of February I’ll be detailing those vegan soup recipes here. Last week I detailed how to make a pretty simple vegan broth, so this week I’m going to start making variations on it. I’ve eaten a lot of borscht in my time, but I’ve only made it once before. I looked up several recipes before making this one, and there were so many variations. Some had vinegar, some didn’t. Some had tomato, some had none. Some were rustic and chunky, some were a smoother puree. I wsn’t quite sure what I wanted to do, I decided to do a little bit of everything. I started the same way I did last week, by soaking dried mushrooms in hot eater and sauteing half of an onion in canola oil with salt and pepper. But then I made a major change. Once the onions were nice and soft I added a generous splash of apple cider vinegar, and let it reduce for a moment. Then I added the mushroom liquid, a lot more water, and seasoned with some more salt. I peeled three small beets and cut them into one inch pieces, reserving the beet greens for later. I added the beets to the soup, as well as a quarter of a savoy cabbage which I had also chopped into pieces. Finally I added half of a can of diced tomatoes. I brought this to a boil, then covered the pot, turned down the heart, and let it simmer. While the beets and cabbage were softening in the soup (which took quite a while) I but the beet greens into thin strips, then added those to the soup as well. Once the beets and cabbage were pretty soft I ladled about two cups of the soup (along with some beet and cabbage pieces) into another smaller pot. I added another splash of apple cider vinegar to that pot and brought it to a boil. Then I used my immersion blender to puree the mixture, and once it was smooth I added it back to the main pot. This helped add body and texture to the borscht. I brought this new mixture back to a boil, then let it simmer for another few minutes, then let it cool before serving it up. If I had some dill I would have sprinkled some on top, but I didn’t so I didn’t. 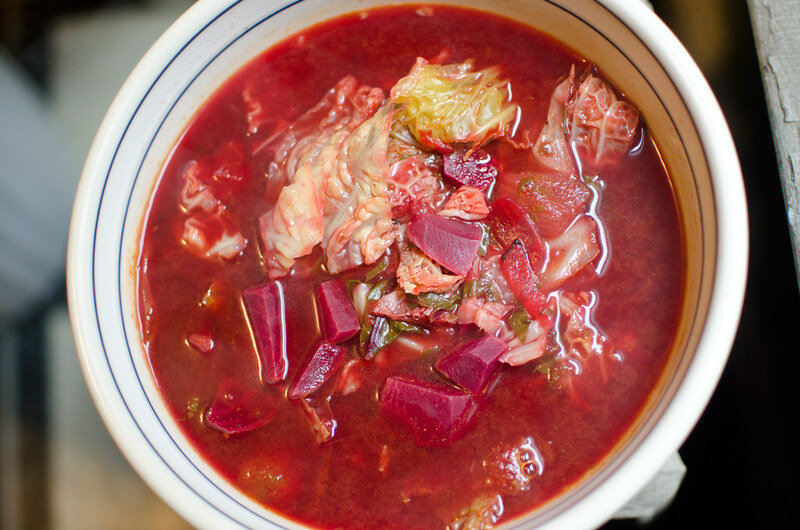 The borscht had a great mix of sweet, salty, and sour. It was even better re-heated after a few days in the fridge, when all of the flavors had melded and everything had turned a deep ruby color. Do you have a favorite vegan soup recipe? Leave it in the comments below. This entry was posted in cooking and tagged borscht, cooking, recipe, soup, vegan. Bookmark the permalink.